Irishman John Minihan is one of the greatest portrait photographers of our age and we are honored to bring him to the keynote stage at TBEX Dublin. Born in Dublin in 1946, and raised in Athy, County Kildare, he moved to London at the age of 12, eventually becoming an apprentice photographer with the Daily Mail. 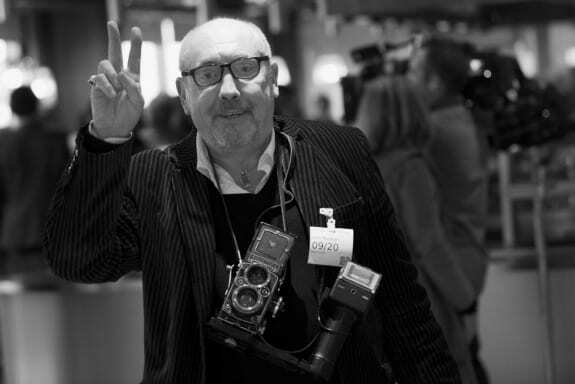 At 21 he became the youngest staff photographer for the Evening Standard. He remained in London for 30 years, returning to his hometown every year where he photographed local people in their daily lives. He shoots solely in black and white. You may not recognize John’s name or face, but chance are you’ll recognize his body of work. He’s probably best known for his photos of Nobel Prize winner (Literature) Samuel Beckett. One shot of Beckett, taken in a café in Paris in 1985, is often described as the photo of the century. Or, you may recognize photos of some of his other subjects from the worlds of fashion, music, theatre, literature and celebrity, including Al Pacino, Andy Warhol, Seamus Heaney, and a young Diana Spencer. John’s work has appeared in numerous publications and hangs in galleries and museums around the world, including the National Portrait Gallery and the Centre Georges Pompidou in Paris. This Friday morning keynote will be in interview style, facilitated by Alastair McKenzie. Lovers of photography, of art, and the commitment to excellence in craft should set their alarms early to get a good seat. John Minihan’s keynote appearance at TBEX Dublin is made possible by sponsor Kildare Village Chic Outlet Shopping. John will be leading a master class for attendees participating in the post-TBEX trip, The Art of Seeing: Photography and Fashion in Kildare, the Thoroughbred County. He’ll also be providing a portrait of one lucky attendee as part of an Instagram contest.